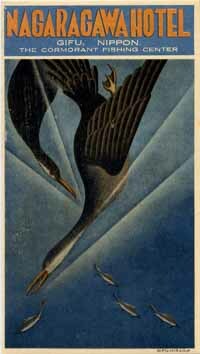 Not all Art Nouveau design and graphics were based on the languid curves lines that some considered decadent. Some trends within the Art Nouveau movement favored elongated and predominantly rectilinear forms as seen in the decoration of the label at left. By 1905 Austrian artists of the Wiener Werkstätte were using wholly geometrical and often linear graphic solutions of great originality and strength. They are classified within the Art Nouveau movement but most of their industrial design, architectural- and art work of, say, 1908 would not seem out of place twenty years in the future. It is to the everlasting credit of the Austrian genius that Wiener Werkstätte labels, like the one at right, are only datable within a 20-year uncertainty period. Art Nouveau practitioners recognized that, although the flowing lines of their style adapted well to the forms of Nature, the linear and geometric shapes of industrial products such as trains and cars could not be properly rendered and were thus best avoided as a main subject or decoration theme. However, others were finding inspiration in those complex machines made of simple geometrical forms. The so-called machine-aesthetic is not an art movement but rather a denomination including design of all kinds that accepts the sound geometrical principles of machine-made products and adapts all its elements to the primacy of such shapes. The image used in the label at top left dates from circa 1909, while the label at right probably dates from around 1914. Both exemplify the clean machine-aesthetic in the rendering of architectural elements and the lettering. The vitality of Art at any given period might well be measured by the number of avant-garde movements: people with new, often cranky-sounding ideas that eventually find acceptance. One such movement was Italian Futurism, started by F. Marinetti in 1909 as a revolution that advocated typography as art and proposed disharmony through the use of up to twenty fonts in three or more colors in any one page. From 1919 the Bauhaus produced examples that were inspired on those and other principles. Bauhaus graphics made use of several different font types and simple geometric forms, often in black and red, as in the label at left. Another avant-garde movement that also influenced Bauhaus graphics was Russian Constructivism. 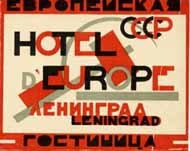 First stated shortly before the October Revolution, the movement's nonfigurative visual vocabulary relied on brightly colored (often angular ) shapes, bold lettering and collage designs. Communist in inspiration, the constructivists were nonetheless soon eyed with suspicion by the Soviets. 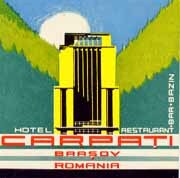 Its short life in a country in turmoil makes true constructivist designs some of the rarest and most desirable of all hotel labels. The origins of Cubism are still earlier than those of Futurism, being traceable to experiments in color and shape started by Picasso and Braque in 1906. Pure Cubism aimed at conveying the essence of objects through a perspective of geometric shapes and was averse to an excess of color. Cubist hotel labels, like the one at left, are very unusual. Plain Art Deco was a global style that flourished between wars and was characterized, in its graphic avatar, by an overall preference for simple and often striking geometrical shapes, elongated figures and objects, bright contrasting colors and special, usually non-seriffed typefaces (serifs are the small marks on the tops and bottoms of types as found on classical fonts like Times New Roman that browsers use as default, but not on Helvetica in which this text is written). The name Art Deco was coined in the 1960s after the 1925 Paris International Exhibition (Exposition Internationale Des Arts Decoratifs et Industriels Modernes). In its heyday it was known simply as the Style Moderne. Thanks to its bold rectilinear forms, Art Deco easily integrated cars, planes and other technological symbols of the modern world. 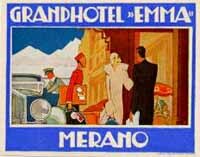 The futuristic shapes and colors also conveyed the optimism of the 1920s, when its popularity peaked. 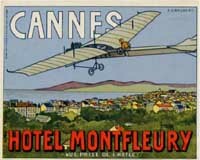 The homeland of Art Deco is often said to be France. This statement is based on the fact that the style triumphed at the 1925 Paris Exhibition and through it received a wider recognition than ever before. However its roots stemmed from many countries: not only France, but Austria, Germany, Scotland, Belgium, Russia, (...), and particularly Italy can claim fair shares of credit. 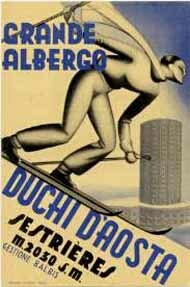 An important source of the individuality of the superb Italian Deco was Futurism, briefly mentioned above. In his manifestos Marinetti advocated an uncanny mix of Italian nationalism, militarism, and 'the new religion of speed', as expressed through cars and airplanes. From typography Futurism spread to other fields of graphism and after some "taming" that did away with its most extreme propositions and hybridizing with other deco trends it came to be the graphic style of Mussolini's Italy. Futurism-inspired Italian Deco uses characteristic hand-drawn lettering, often with several fonts of different colors to the page. Another distinguishing characteristic of typical Italian designs is the widespread use of the airbrush grading of colors into white, as illustrated by some of the most representative labels of the period. The very best designs, often wasted in such trivial items as chocolate wrappings, covers for minor magazines, or calendars, are as strikingly fresh and attractive today as they must have been in their time. 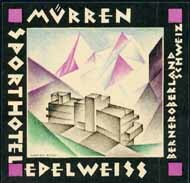 The label at right is characteristic of Italian Deco. There are at least four different fonts in three colors; some of the text is at an angle with the rest. The color of the elongated skier was airbrushed. During the 1920s, Art Deco found new grounds and flourished with unsuspected vigor in the United States. After all, was this not an art for the Age of the Machine, which America symbolized above all others? 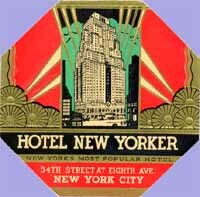 As far as hotel labels are concerned, there are tens of American deco designs but few to really sparkle a choosy collector's interest. Noteworthy exceptions are a series of octagonal labels, of which one is displayed at left, in which the frames show unusual designs inspired by deco architectural decorations of the time. In the end, Deco spread the world. In Japan, it drew with unexpected success from the same forces that fought for the modernization and industrialization of the country. There is a surprising number of Deco Japanese labels, of which the example at right is maybe the most extraordinary. In colonial territories, the style spread from the modernities of the home country, often through designs ordered from Europe or by the efforts of one single local designer whose style was later taken by others. 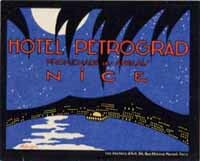 Hotels in French and Italian N.Africa used a wide variety of Deco labels ordered from France and Italy; the Dutch East Indies, on the other side, were also a Deco oasis but mostly through the efforts of local designers of which the most prolific was Jan Lavies. Then as today, modernity clashes with conservative views and Art Deco never really caught with some people. Many hotel managers specifically ordered labels made "in the old style". This was particularly the case for the high-class Palace Hotels and for other exclusive town hotels- their owners were less willing to risk on novelties than owners of less pretentious establishments. 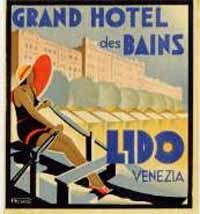 It was thus that printers like Richter could survive even though (with very few exceptions) they did not design Deco labels, while others, like Barabino & Graeve who probably printed the label for the Grand Hotel des Bains in the Lido of Venice, practically used exclusively the new style. It is also for the same reason that Deco labels are more common in vacation spots than in large towns. 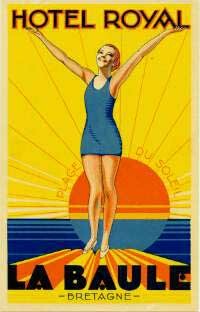 According to most sources, Art Deco died at the onset of the Second World War. 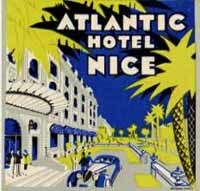 Yet its attractive styling and modern looks were not really buried and many hotel labels of the 1940s and 50s can be said to be closer to Deco than to any other style. This is particularly true of labels designed for hotels within the Iron Curtain, although the style was, by then, tired and the designs were not as attractive as they had once been. Yet, and as far as labels are concerned, in a way Deco lived until the demise of the luggage label itself.